LiveWell Chiropractic & Wellness offers gentle, effective health care that allows your child to enjoy their greatest possible well-being. In today’s world, so many children are taking medications that can have dangerous side effects. Chiropractic care may offer you a different solution to improve your child’s function. Dr. Angie is passionate about caring for babies and children. 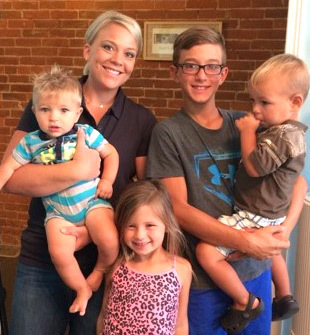 As a mother with two young sons, she knows through her own experience the benefits of chiropractic for pediatric patients. Through gentle and consistent chiropractic care, many of these issues found in our young patients are resolved with no medications or further medical treatments. Dr. Angie focuses on the health of your child’s nervous system, which is responsible for controlling and coordinating everything else in the body. Though you can easily see measurable outcomes like height and weight with your child, you cannot see if their nerve function is at optimal levels. We complete a full assessment to understand their full-body health rather than looking only to the symptoms present. By improving the body’s command center, their health can flourish. The benefits of chiropractic care for our young patients are vast and include growing up healthier and stronger, achieving all developmental milestones at the proper times and avoiding common problems as adults. Chiropractic care is extremely different for children than it is for adults. With infants, a simple sustained contact is all that is necessary – about the same pressure you would use to check the ripeness of a tomato in the grocery store. Often, they sleep right through the adjustment. Activator Methods® instrument-based adjusting is also utilized on children, and a pediatric drop piece makes it easy and comfortable for them. Dr. Angie is skilled in delivering adjustments to children, often while they are playing or running around the office. One of Dr. Angie’s young practice members was a little girl about two years old who had experienced seven ear infections. They were a constant in her life, and finally, the medical doctor said she would have to get tubes put in her ears. Her mother brought her to Dr. Angie as a last resort, feeling there was nothing to lose by trying chiropractic care. After beginning care, there was progress, and the surgery was avoided. The little girl never suffered through another ear infection and is still seeing Dr. Angie regularly. Chiropractic should be the first choice, offering you and your family solutions without lifelong medications or risky surgery. Contact us today to schedule an appointment.